Scotland is still somewhat of a desert for real ale, though it is improving greatly. There are certainly pockets of glory such as Edinburgh, where you can sup as well as anywhere in the UK, but over in the West, this is less so. Where cask isn't king, you may well run into problems in the quality of the beer served, particularly as less busy times. Now it wouldn't be fair not to mention the honourable exceptions. The Bon Accord in keeping with its venerable tradition of serving real ale* provided beer in excellent condition and a special mention must go to the Dunbartonshire CAMRA Pub of the Year, the Ashton in Helensburgh which, on a quiet Wednesday afternoon, supplied top notch beer from the nearby Loch Lomond Brewery despite me being the only customer drinking it. Top marks too for friendliness, though you could add that praise to quite a few of the Glasgow pubs. The beer might have let me down but the customers certainly didn't. People DO make Glasgow. So, what's the cause? Lack of turnover in the midweek most likely and Tennents Lager. In every pub, even the two I praised, everyone (more or less) was scooping the old TL down for fun. And it looked fun too. You'll struggle to keep real ale well where the demand is so slack. In addition, too many of the pubs had too many beers on and not enough people drinking them. I don't envy the job the Campaign has to do in Scotland. 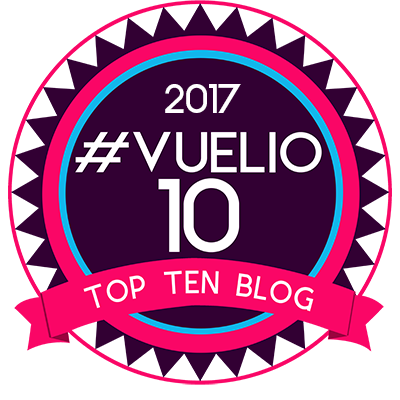 They've made great inroads, but it is a bit of an uphill task you know. They've been drinking lager there for more years than most. 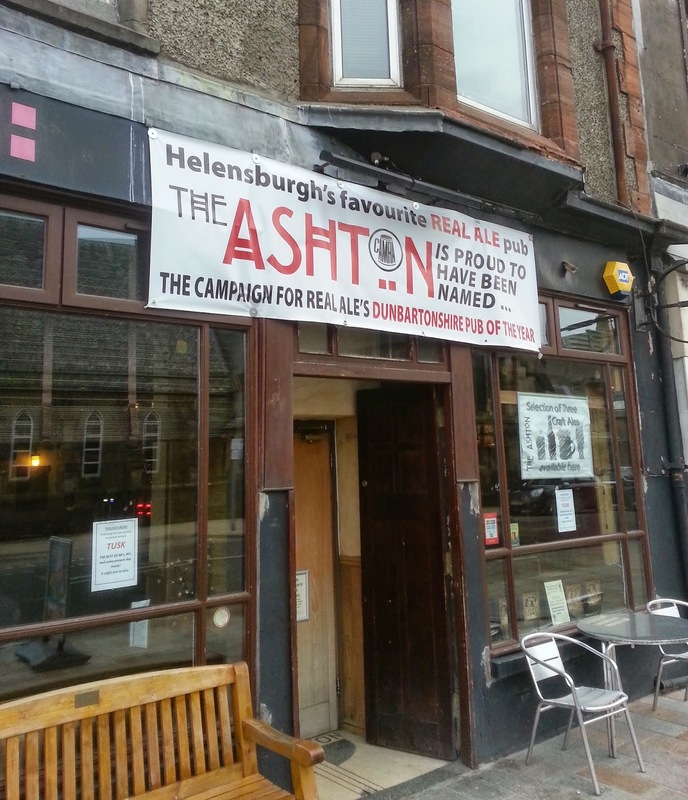 The history of lager drinking in Scotland goes back a very long way indeed. It seems to have a bright present too. * I had my first ever pint of cask beer in here in 1974 and no apologies for banging on about beer quality yet again. I will continue to do so. It is an obsession of mine. In JDW pubs the beer was cheap. As low as £1.49 in Dumbarton, £1.79 in Helensburgh and just above £2 in Glasgow. And it still wasn't shifting. More serendipity for me. Reading about the new(ish) Tapped in Leeds one morning in Beer Magazine and visiting it unexpectedly the next day. This is getting spooky. I used to work in Leeds and still visit it now and then. One such time was a couple of Saturdays ago while E was having her hair done. I accompanied her and had three hours to myself. A pleasant 45 minute walk from Headingley through student territory took me to the City Centre. Plenty of people watching on the way added to an interesting downhill stroll. Friends of Ham, much lauded in various Leedsy blogs was a tiny place when I last visited it, but now it seems to have doubled or more in size. At just before one o'clock it was packed with a mixed crowd scoffing Iberian porcine products and not a few drinkers. 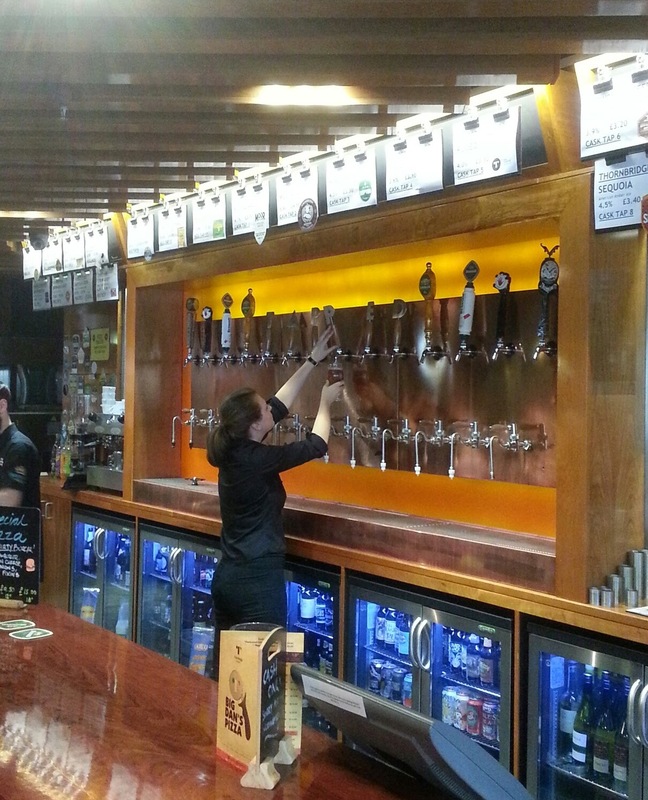 There was around three cask beers and a number of keg ones and brisk, friendly service. I didn't notice any obtrusive music and the place was abuzz with conversation. Big ticks all round. A bonus was bumping into two of my lads scouting out the place for our forthcoming CAMRA Branch crawl of Leeds. The dedication of these people knows no bounds. I joined them for a quick half of something dark and delicious. It was in peak condition as you'd expect in Leeds. OK they served it in those daft dimpled mugs, but one can't have everything. However delightful as Friends of Ham was, I wanted to visit Tapped, just across the road in Boar Lane. This is a large beer hall sort of place. Large windows out front let in (surprisingly little) light. There are tall tables in rows, a long bar, subdued lighting and a small, shiny brewery down one side along the wall. It was again bustling, but service was quick and pleasant and the beer choice was good. I didn't count the taps, American style against the bar wall, but I'm sure in mid twenties, evenly distributed between cask and keg. Beers were competitively priced and the cask in immaculate condition. 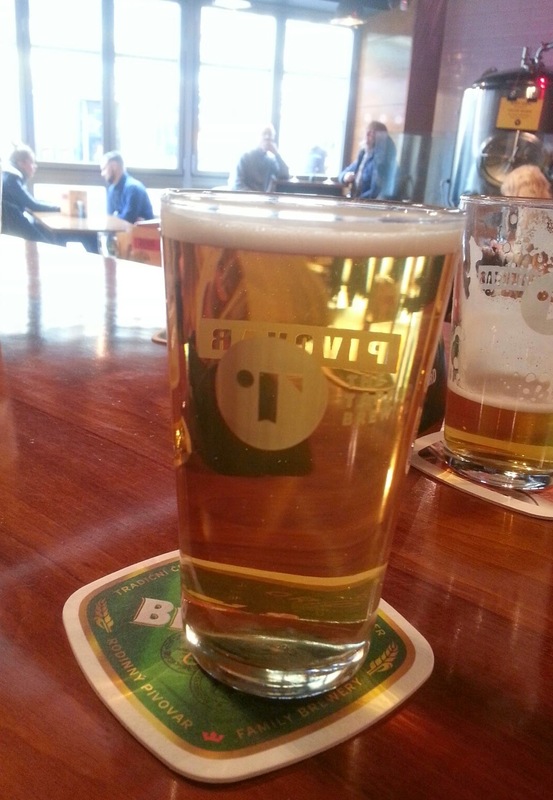 I enjoyed Brewsmith Pale Ale from my own area and Anarchy, brewed on the premises which was "unfined" but clear as a bell. Any bum notes? Only the ghastly "chick chick" bass music that was both unwelcome and unnecessary. Still great though and well done. Time was drawing on though. I had to be outside the Palace (my old Leeds local) to meet the newly coiffured E in an hour and I still had to visit that venerable and excellent institution, Leeds Market for some vittals. That done it was time for a couple of swift halves in the Palace. 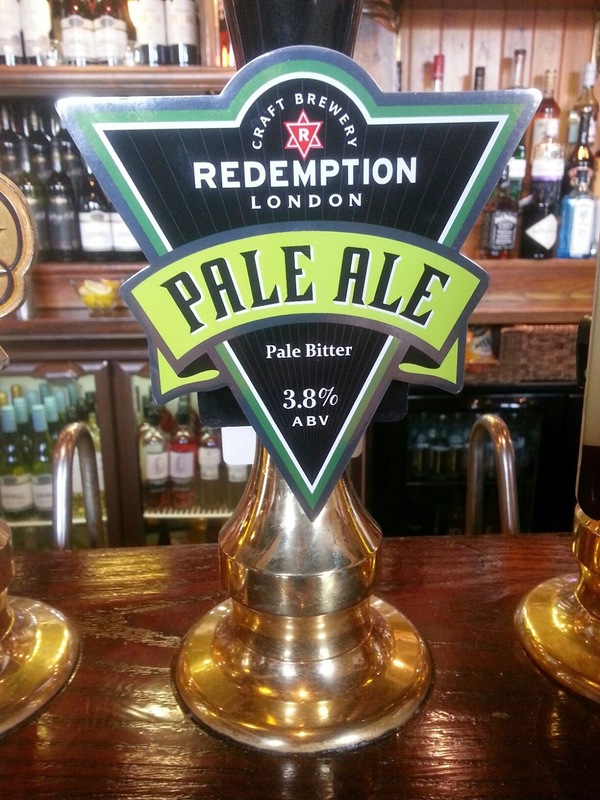 Alas no Ind Coope Burton Ale, but I was able to contrast and compare London's Redemption Pale Ale served Northern style with what happens to it in its native territory. It was like drinking a different beer, subtle hops, good malt base, well conditioned, sparkled and cellar temperature. Tick, tick, tick. The Palace was busy too, the beer was good and I left for my lift in good cheer. I'd tried around eight beers and all were different and all were good. I'm looking forward to our day out there at the end of the month. These days I always look for some kind of conclusion to draw from my all too few days out. 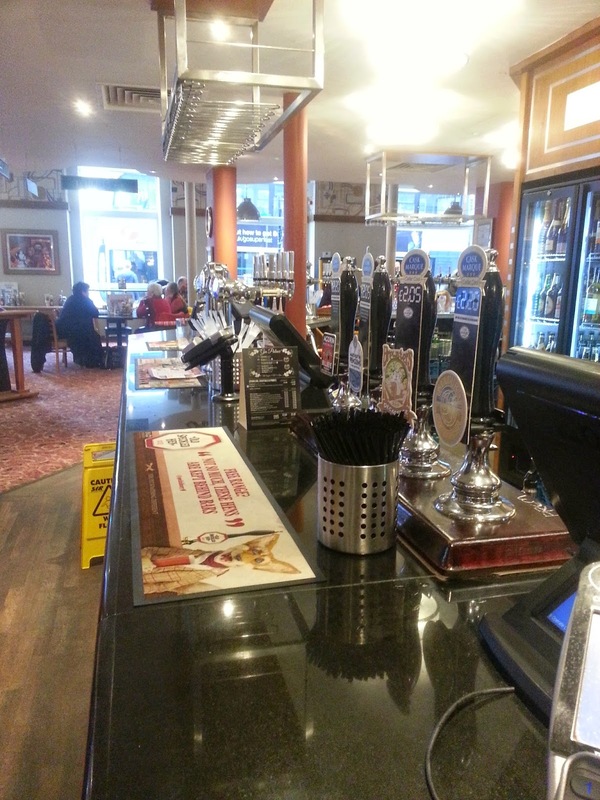 This time it is that Leeds is still great for well kept cask beer. The people behind the various "Taps" really know what they are doing and that the Manchester one(s) will be a great success when they open in the next couple of months. It also reinforces in my mind that there is nothing difficult at all in keeping and presenting cask beer well. You need a cellar between 10 and 13C, insulated beer lines and beer which has not been over-vented. And above all you actually need to know what you are doing, but you can learn the basics in ten minutes and then build on it. Brewers of "London Murky" style beers please note that unfined beer is not enhanced by the electric soup approach. Unfined does not have to equal murky. See photo. I didn't try any of the keg beers. Why bother when the cask is so good? It is still a distress purchase for me by and large. Lager excepted. It a bit of neat symmetry, I read the article in the most recent Beer Magazine in which two different CAMRA members argue the case about the merits of supporting beer styles like mild with their own promotion etc. just before I visited JW Lees Horton Arms, a neat pub tucked under the motorway bridge in leafy Chadderton, a two-bus bus ride away from my house. Now the Horton Arms is an old haunt of mine from years ago and it was often referred to when in the Good Beer Guide, as a bit of a country style pub. It attracted a staunchly local crowd and was traditional in internal appearance, with horse brasses and paraphernalia on the walls, a separate room at the side as you went in which often showed sports, a beer garden used mainly by smokers and internally consisted of a number of distinct drinking areas attracting different customer types. It was always bright and gleaming and popular with a mainly beer drinking crowd, although food was available lunchtimes. It has been a Lees tenancy for years. We'd arranged to meet some friends there as none of us had really been there since it was done up not that long ago - well I had on a busy Sunday where you couldn't really see much of the changes, such was the crowd - and anyway, it just seemed worth checking out. It isn't a million miles form my own local and we all know some of the Horton regulars from our visits there and their visits to our gaff, so an amenable visit was in store. Unusually this pub used to be a bit of a bastion of "mixed" where mild and bitter, half of each, is served in a pint glass. Talking to one of the locals, it still is it seems and back to my original theme, it means that cask mild is available. I decided to have a pint of mild to start with, or rather Brewer's Dark as it is known now. Things started badly with the barmaid starting to pour me Dark Smooth. That was easily sorted out, but here's a tip for publicans selling cask and smooth versions of the same beer: always serve cask if the customer doesn't specify (I did by the way, but you win some, lose some). Not only will it increase cask sales, but it means you sell the more perishable product first. Tell your bar staff this, save money and increase beer quality. Obvious and simples really? Now Lees Mild is a former Champion Mild of Britain and this renamed beer is the same recipe. Boy did it show up well here. Rich, luscious, full bodied with a tight creamy head, it was Guinness like in appearance, though a mile ahead in taste. We got chatting to some old friends and as time passed and the buses were only hourly, hung on longer than intended. I certainly can't remember when I last had six pints of mild in a row, but that was a night I did - and every one was delicious too. What of the re-vamped pub? Not so much to my taste to be honest and both the rather intrusive "musak" and the vast array of "reserved" signs showed that the emphasis had changed from drinking to eating, with all of the pub, apart from one small area in the corner, now being eating territory only. Reserved signs and knives and forks on the tables ram home the message. The non eating locals and visitors alike were restricted to the allotted non eating corner, or to a row of poseur tables in front of the bar, which just seemed to get in everyone's way. But this, funnily enough, isn't a criticism as such. I bear in mind that it was a Friday evening and things may well be less prescriptive at other times. You also have to take into account that this is a tenancy and before you blame the brewery, have to bear in mind that changes will be as much the will of the tenant as anything else. If it works for them, pays the rent and leaves some money over, then that is a sound decision. It is a business after all and while it may not entirely suit me or some others, it clearly suits plenty of folks looking for a good value, good quality place to eat. If tables have to be reserved, its popularity cannot and should not be denied and the food looked great too. So what conclusions do I draw? Well that mild is still a tremendous and under-rated drink that deserves to be more widely available and if kept as well as it was here, an absolute joy. So I come down on the side of CAMRA supporting it. Secondly, that while change may be unwelcome in a pub you liked just as it was, it doesn't do to forget that a pub is a business that needs to make money for those that invest in it. It can't stand still or it will surely close its doors. Both licensees and customers should overlook that at their peril. We did, unwisely, step off our bus home (the second of two) a couple of stops early for more beer. A veil should be drawn over that error of judgement. There is overwhelming support for the changes at the Horton on review websites. 9th out of 212 on Tripadvisor I'd say is a point proven. Forchheim isn't just one of those charming Franconian towns that dominate the area between Bamberg and Nuremburg. It is though, like many, picture postcard pretty, but in addition it has great interest to the beer traveller as the home of no less than four breweries. But we aren't here for the beer - well not entirely. We are here to watch the unveiling of the Town Hall Advent Calendar window. The venerable Rathaus uses its many windows as the Schönster Adventskalender der Welt (“World’s Loveliest Advent calendar”). And, lit up with Christmas lights, in a fairy tale setting, it is indeed lovely. 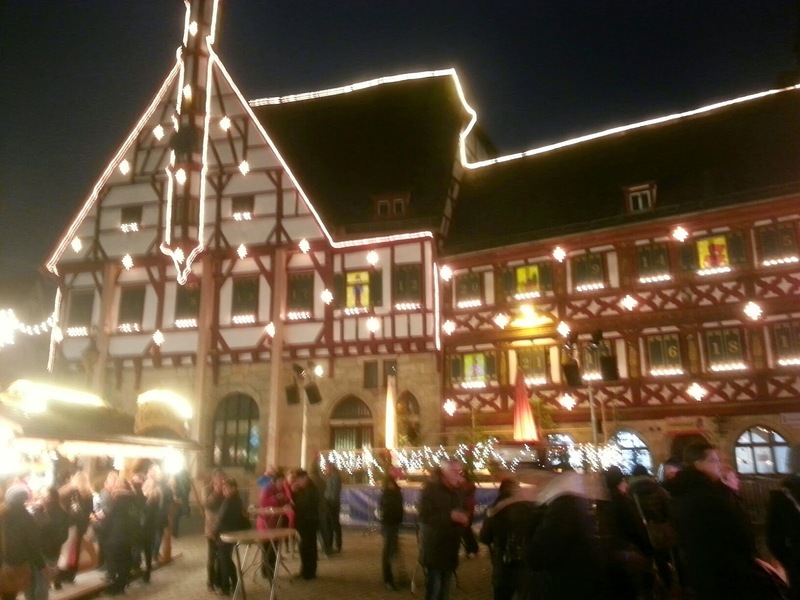 A decent sized Christmas Market, the inevitable mulled wine and bratwurst stands, an easy going and expectant crowd and a small funfair all add to the feeling of bonhomie - or rather gemütlichkeit. The fairly large crowds, jostle for views in that polite but determined German way. There are happy children snaking around the stand up tables and there is even beer - not as common as you might suppose at Christmas Markets in Germany. No rip off prices here either, with a half litre of local pils at €2 and 50 cents back when you return the bottle. There was a band too and an over cheerful MC who attempted to whip the crowd into a frenzy. At the appointed time, spotlighted from another building, a local schoolgirl, dolled up to the nines, opened the appropriate Rathaus window, waved to the crowd and made a charming speech to much good natured applause. The air was full of sizzling sausages, wine, donuts, pizza and Christmas cheer. In the cold, crisp December air, it was just perfect. But man does not live by such bucolic scenes alone. We made our way to one of my favourite hostelries for proper beer. The pub and brewery, Brauerei Neder, is typically German. Seemingly small on the outside, but with a Tardis like interior. The side door to the main room was locked, so we made our way through the noisy corridor where it seemed everyone was smoking furiously and probably illegally, to the far door where we fought our way in. We were immediately taken in hand by the female server, who said one word: "Zwo?" I nod and she snakes her way through the throng to the front of the pub and orders a group of drinkers to make room. They do and we are told where to sit - edged against the locked door with a perfect view of the beer servery and the whole room. A prime spot. Two beers are brought without further ado. Broadly in the kellerbier style, totally delicious and a mere €1.90 a pop. Outside it is cold, but inside it is steamingly warm. A couple of accordion playing dudes are giving Deutsche Blasmusik their all, while the crowd - some of them at least - sing along, or tap their tables enthusiastically. Along the front of the pub, which somehow seems like the back wall, a group are playing Skat - or it could be Schafkopf, both of which are popular German card games of impenetrable rules, that, whichever it is, involve a lot of noisy shouting and table thumping. Some play and others bawl encouragement or derision at the players from the sidelines. They compete happily with the accordionists and nobody seems to care. In the midst of all this good natured chaos, our matronly saviour slaps down half litre stone pots of beer as soon as an empty one is laid on its side - the signal from the thirsty that another is required. She is kept very busy. Our tablemates, by now used to our presence, nod to us. Another one arrives and squeezes in, tapping with his knuckles on the table at our position. The unspoken greeting of Franconia. We look at the crowd and having been there before, the odd face starts to look familiar. There are some, shall we say, rather individual types in this town that aren't easily forgotten. One or two raise their steins to us and we beam back. I'm watching the mystifying card game when E nudges me. "I've pulled!" An elderly gent smiles and winks at her. She smiles and toasts him. It is harmless fun. And great fun it is too. Soon we are lucky enough to hear a song we know on the squeeze box. Along with the crowd we roar out "Eins Zwei Zuffa". This is more commonly sung in the Hobraühaus in Munich and here the words are adapted to be local, but we know the tune and sort of know the words, so we sing. It is so German, so Franconian and just a sheer pleasure to be a small part of it. We are the only two there that aren't local, yet we feel welcome. And happy. 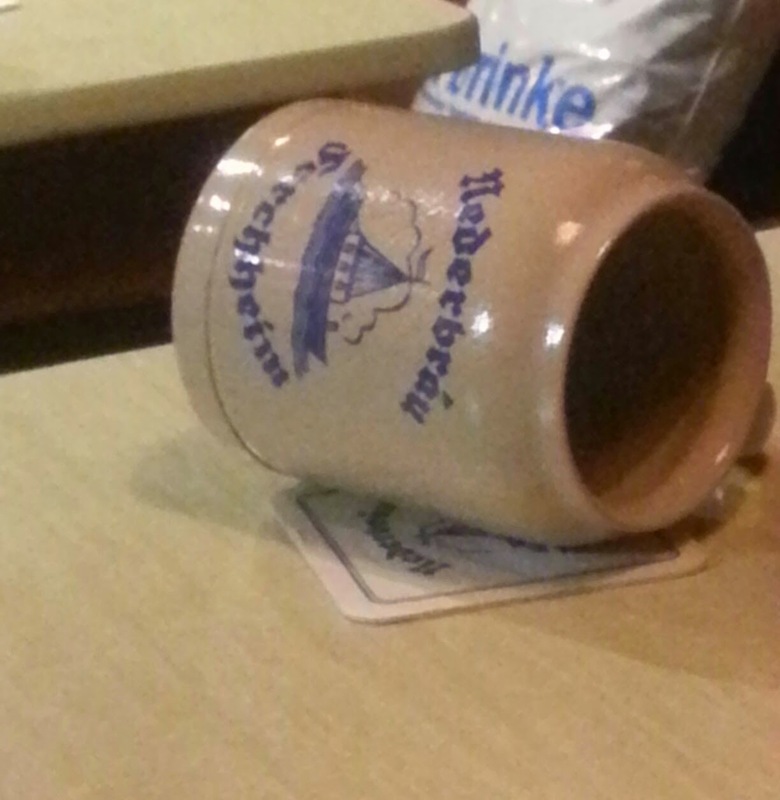 My stein is placed on its side more than once. This beer slips down easily. All too soon though the musical duo cease their merry din. The set and indeed the act is over. I come across them at the back, when going for a pee. Now off duty, but still with their instruments strung across their chests as if ready to swing back into action, they are knocking back the same beer as everyone else, young or old, male or female. That's just how it is. We look on this interlude as a cue to depart, though we don't go far. Almost next door is Brauerei Hebendanz where there is a much more sedate crowd, but again, no obvious seats. We are once more taken in hand by the Boss. He finds us a corner and brings us, unbidden, two beers. We sup contentedly and are nodded to cheerily by our table companions. Social inclusion. That's the secret to it all. Even when you aren't obviously part of it, you are. Forchheim is on the main Nuremburg - Bamberg rail line. It is about 20 odd minutes from Bamberg and half an hour from Nuremberg. We also chalked up the only brewery I hadn't visited before as it has always been closed, Brauerei Eichhorn, but that was early doors and it was almost empty.